DUBLIN, Ireland – When Ireland’s national broadcaster, RTÉ Radio upgraded its Studio 10 sports studio recently, it took the network’s tally of Studer OnAir 3000 digital consoles to 19. While 10 are located in the main RTE campus, one occupies an RTE studio in a nearby shopping centre, and the other eight are distributed over five regional studio centres. The broadcaster’s relationship with Studer extends back many years to the A80 tape machines, which were in use in RTÉ Radio for many years, and over the past six years they have systematically upgraded all the main radio studios, replacing various analogue consoles with the OnAir 3000 series — Studio 10 being the last in line. RTÉ Radio’s resident studio guru, Seamus Power, drew up the initial list of requirements for the new desk and the contract for the installation was awarded to local company, Audiohead Ltd, who have extensive experience in installing OnAir 3000s in RTÉ Radio. This studio is used at weekends for fast-moving sports coverage, featuring numerous reports/commentaries from many locations — both national and international. During the working week, Studio 10 is mainly used for production, pre-recording etc, and is occasionally pressed into use for live programmes that feature an extended number of guests (such as election coverage, and recently, the Budget). To meet the many varied requirements, the new OnAir 3000 has been configured for 56 line inputs, 48 line outputs, 16 mic inputs, eight AES/EBU inputs and outputs, 36 faders, two monitor/talkback modules (one for sound operator, one for producer) and two XL modules. Commented John Brew, RTÉ Radio’s Senior Broadcast Engineer, with prime responsibility for special projects, “The features we were looking for were flexibility, ease-of use and reliability. This is a standard console throughout our studios, which facilitates user-familiarity, technical support, and the supply of spare parts. But we also like the features of the SCore Live DSP engine, including eight stereo groups/VCA masters, 48 N-x busses and the use of XL modules. 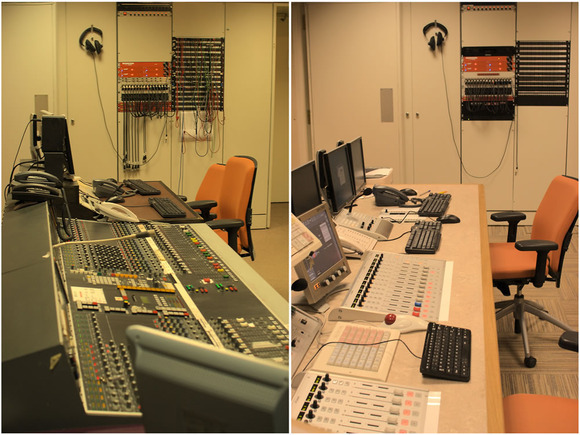 All RTÉ’s studios use Krone architecture with wiring of all studio inputs and outputs, as well as all console inputs and outputs, wired through the jumpered blocks. This enables any future alterations to be easily implemented. As part of the upgrade, new control room furniture was manufactured specifically to cater for the various OnAir 3000 surface modules. Matching cabinets were also built for the Studer rack-mount equipment and to house various PC’s. As a result, from an ergonomic point of view, the working conditions for production staff are greatly improved. The upgraded infrastructure also incorporates a new studio table that features two presenter positions and six guest positions. Musical groups can also be accommodated making Studio 10 the largest of RTÉ Radio’s everyday ‘working’ studios (although, there is also a very large studio to cater for orchestras, choirs etc).